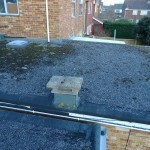 Blocked gutters, Moss on your roof be prepared for winter in Wantage area. 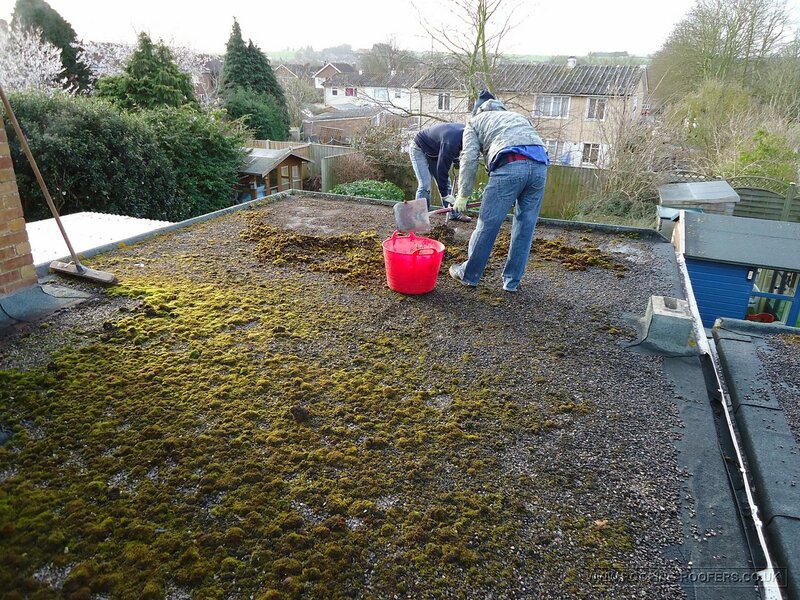 A sudden influx of roof repairs from a tile replacement to clearing guttering and De-mossing roofs ready for the coming winter months. 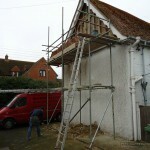 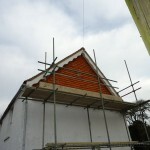 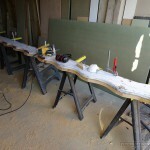 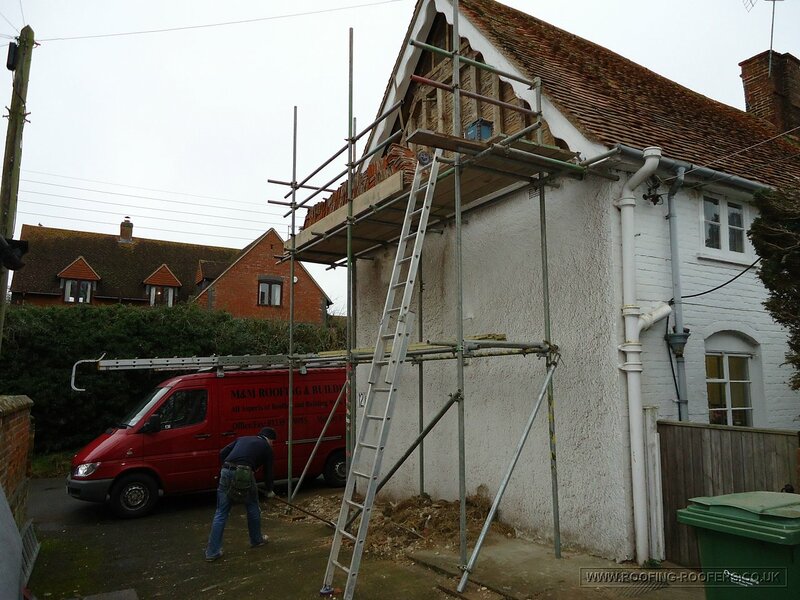 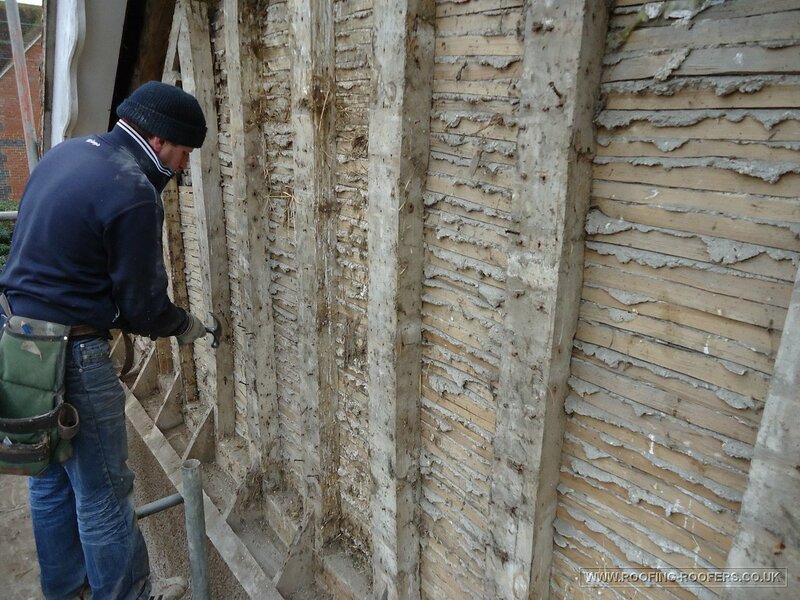 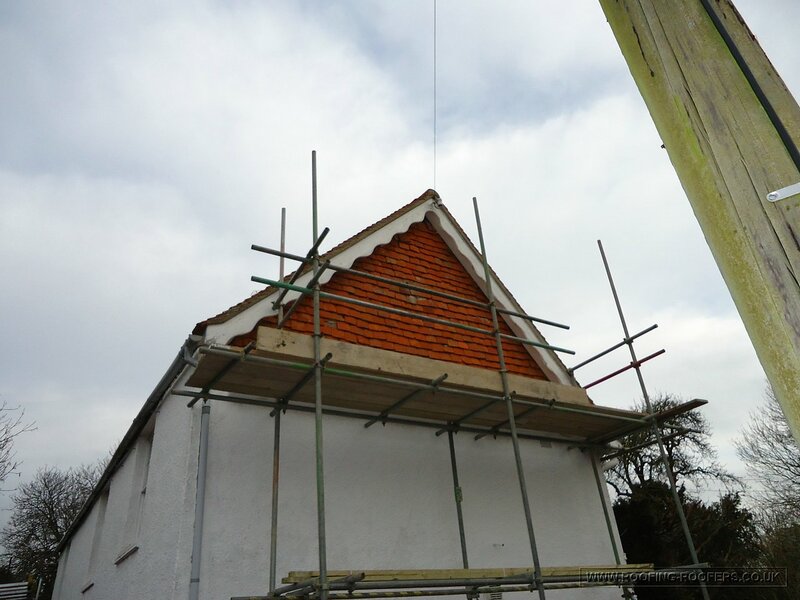 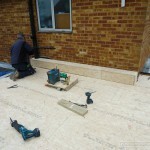 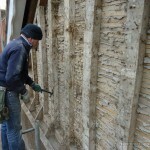 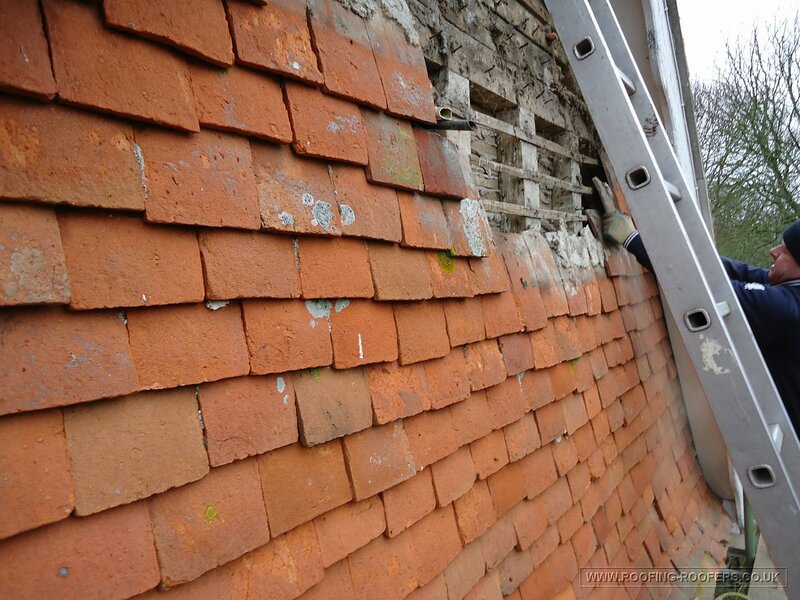 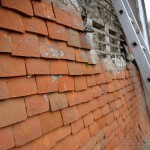 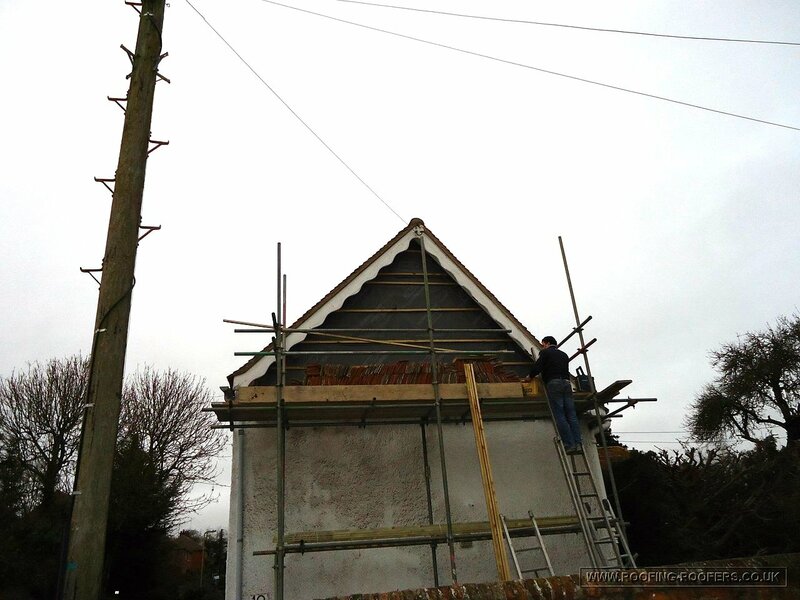 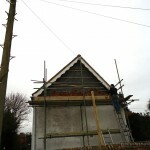 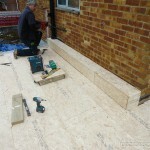 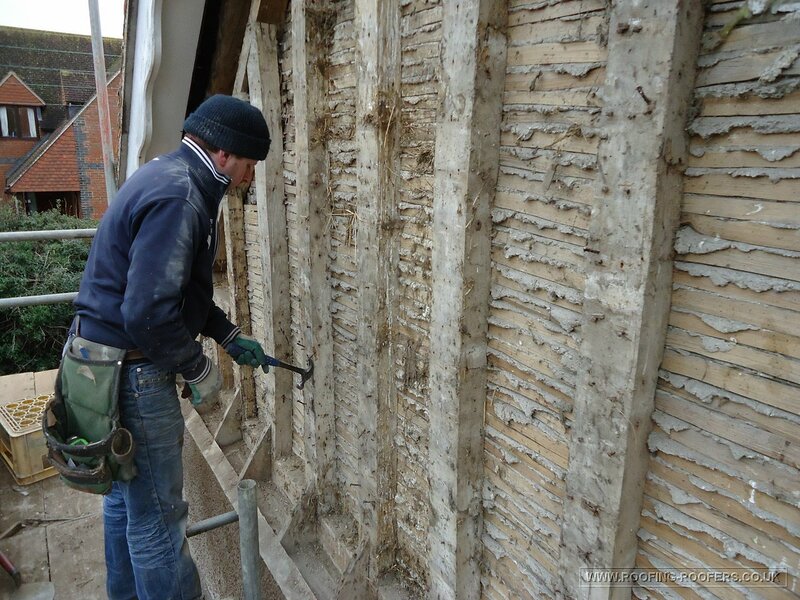 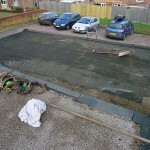 Most of the work is local in Wantage and the surrounding villages of Oxfordshire. 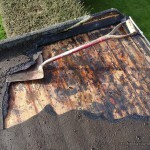 Remember it is worth getting your roof looked over before the real weather sets in. 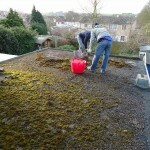 Summer time is ideal to get your roof and gutters checked ready for the unsettled weather that winter time brings. 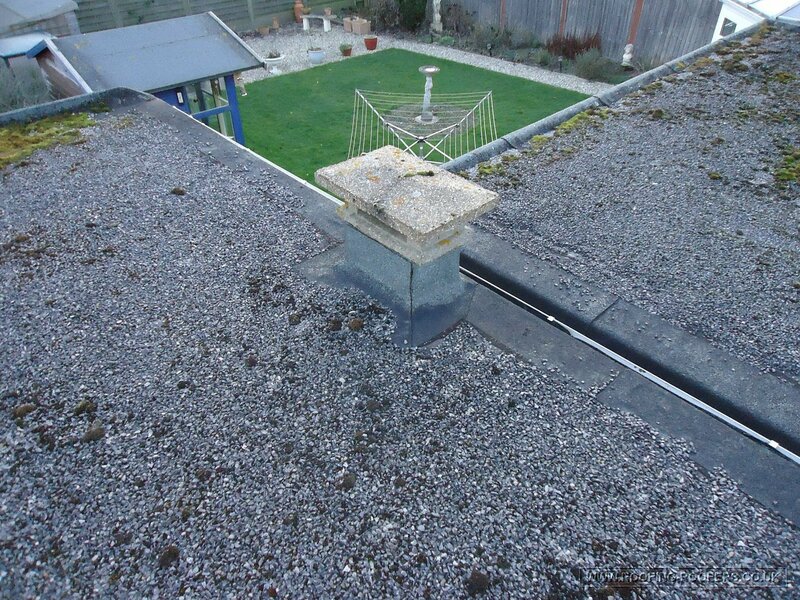 I provide good seasonal maintenance for all roof, chimnet and guttering issues backed by many years of hands on experience. 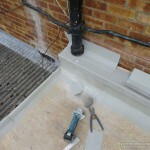 Take a look at my website galleries of past work and fully satisfied customers with all work guaranteed and carried out to the latest standards. 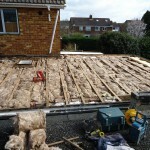 A Job Well Done !! 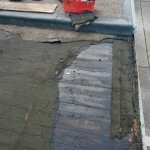 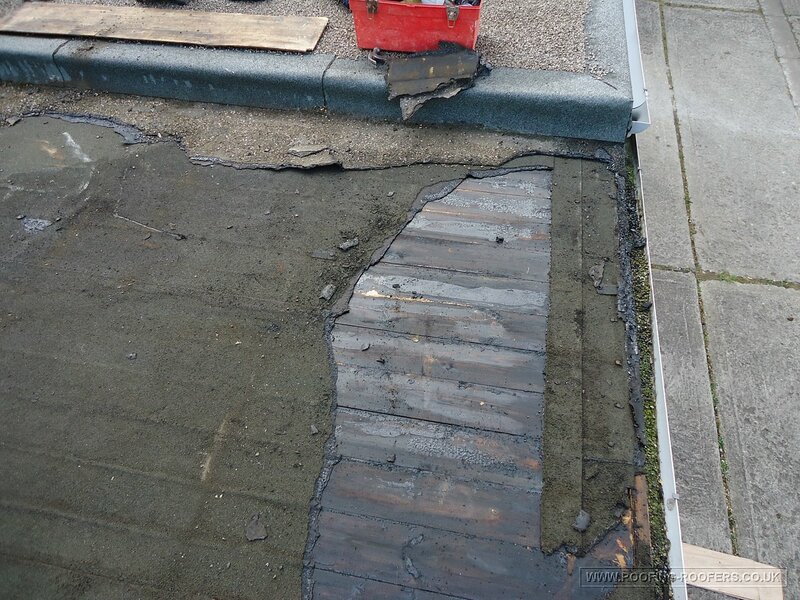 I just wanted to say thank you for your swift and professional work on our flat roof repair. 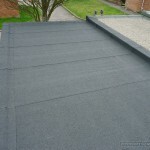 It looks lovely and I was very impressed with the flexibility in your availability. 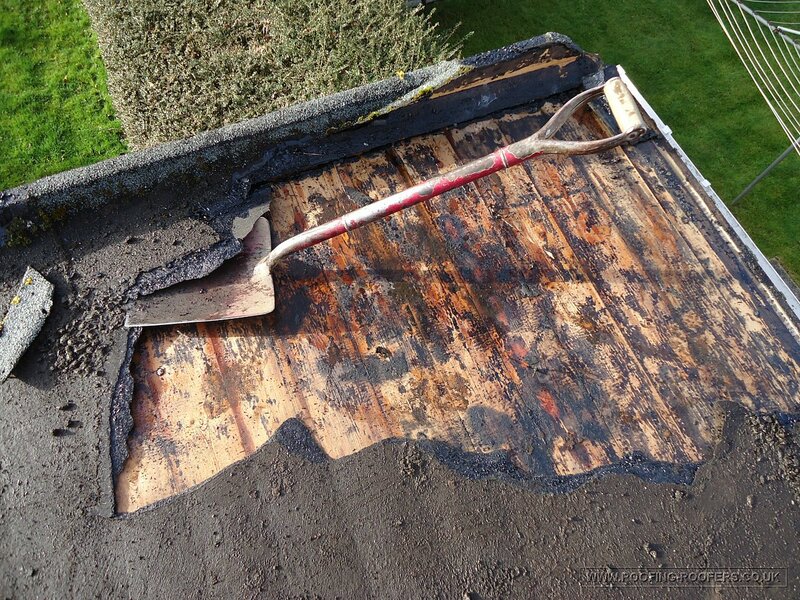 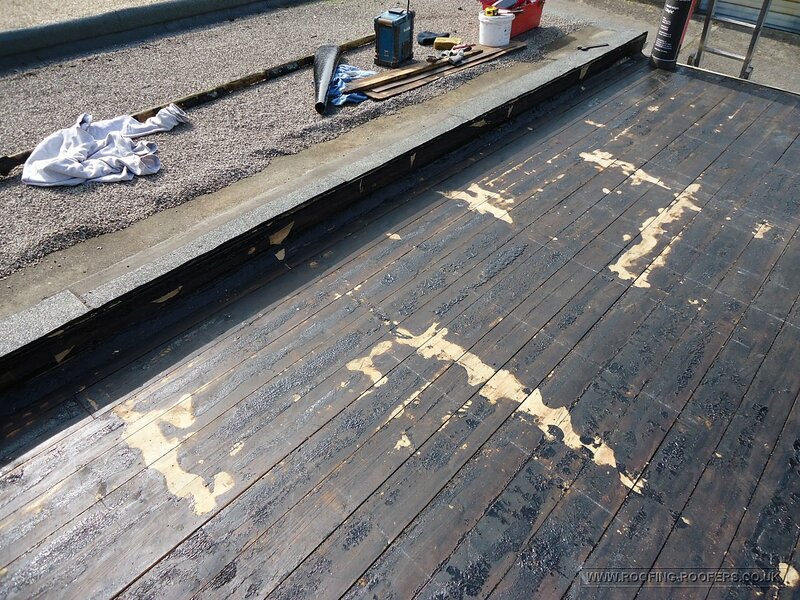 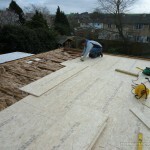 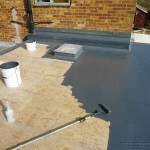 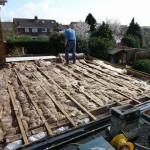 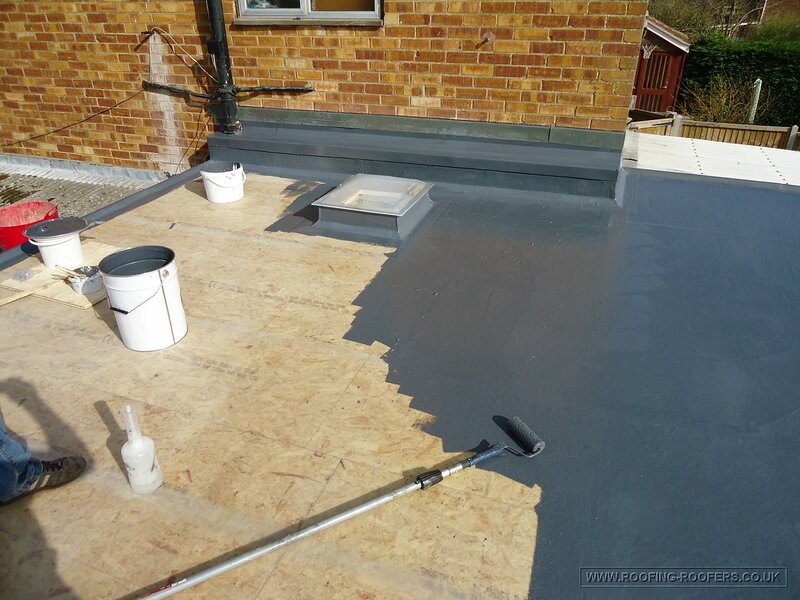 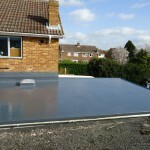 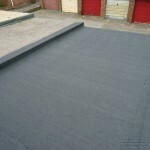 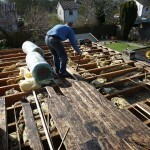 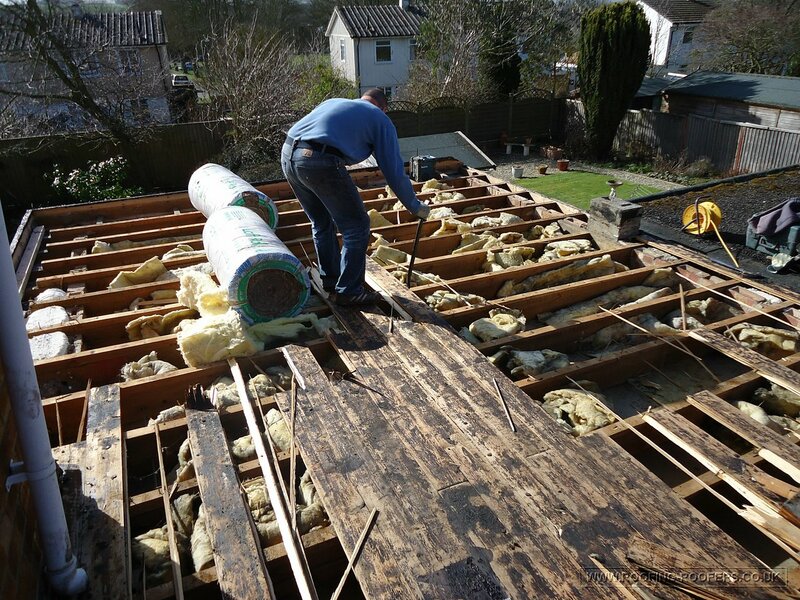 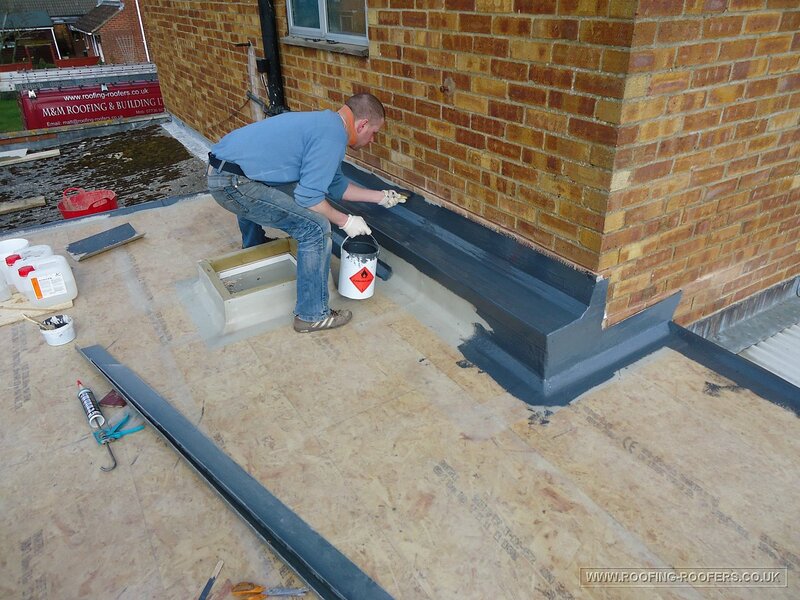 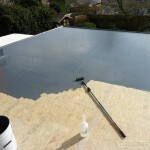 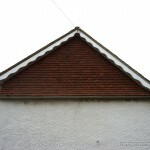 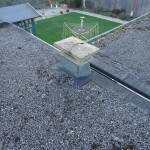 I would recommend you to anyone who needs their flat roof repairing. 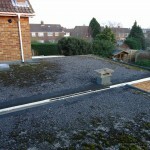 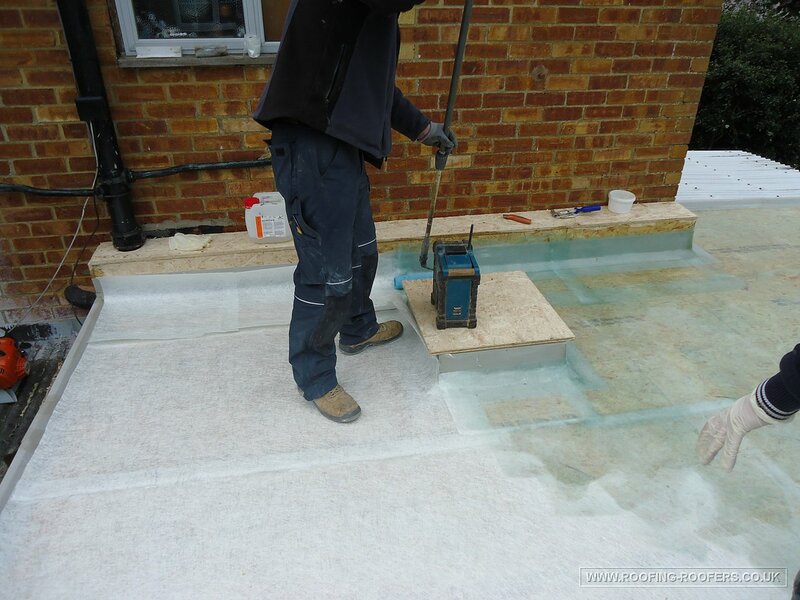 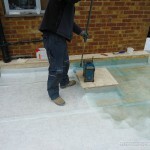 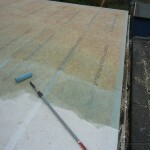 With the sudden change in weather i have had lot’s of enquiries about leaking flat roofs. 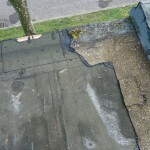 The cold weather, snow and ice have caused the felt to start cracking more and with the rain the ingress of water starts. 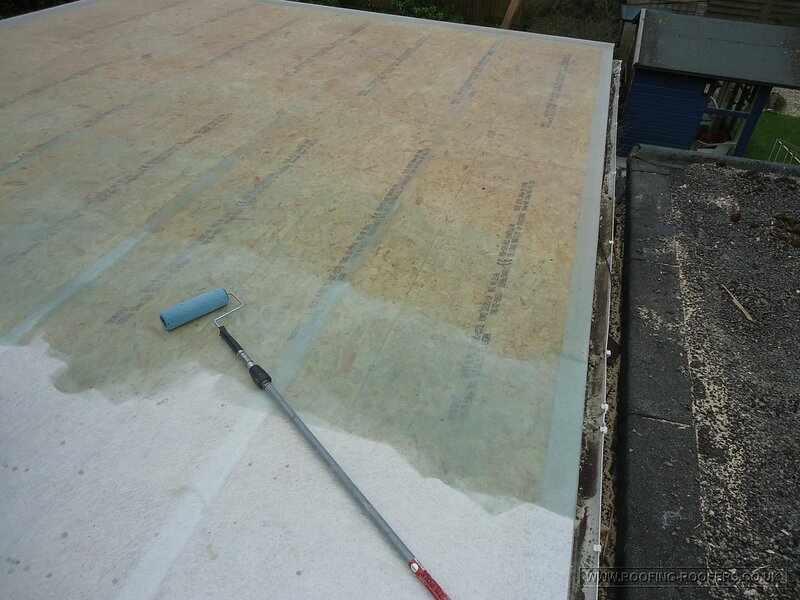 I have sheeted over some roofs as a temporary measure before I can replace it with a new system. 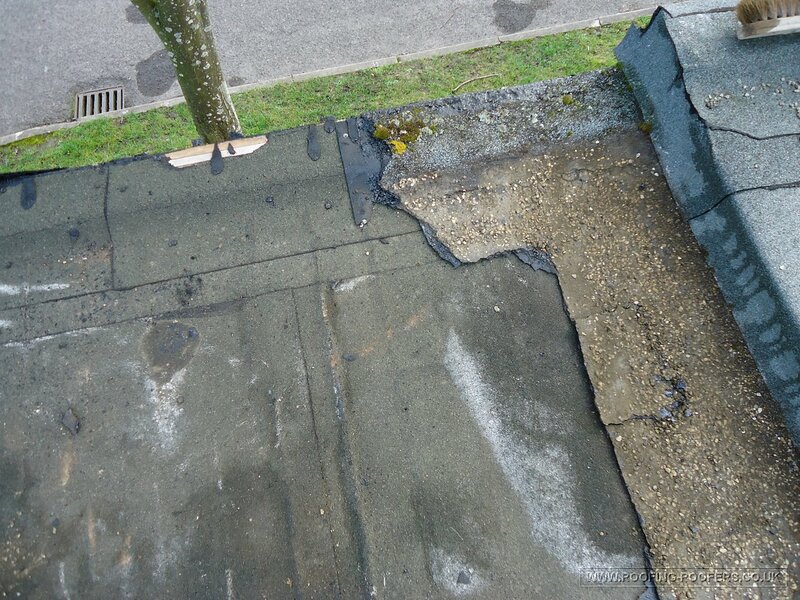 Early signs of leakage should be detected and dealt with before the weather takes hold and damage escalates. 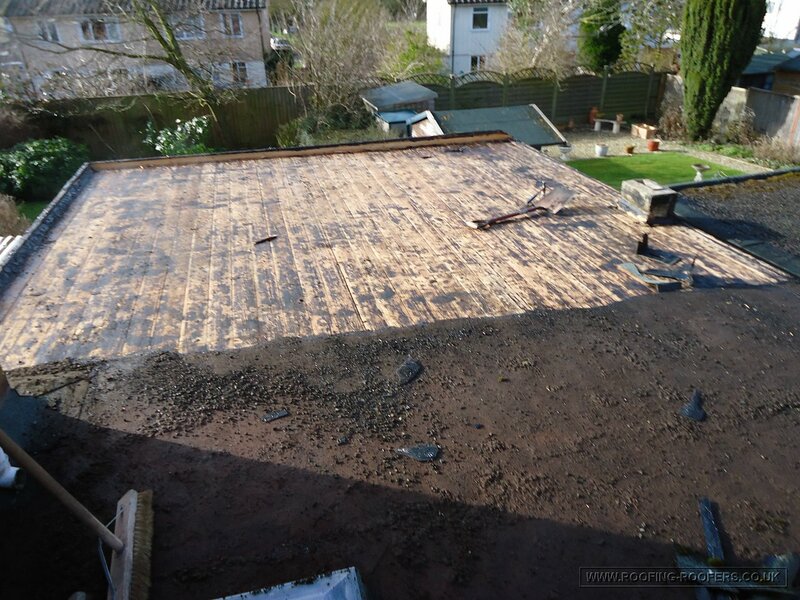 Job Description: Removing existing felted roof to garage and replacing with a three layer heated torch on system with a mineral top coat finish. 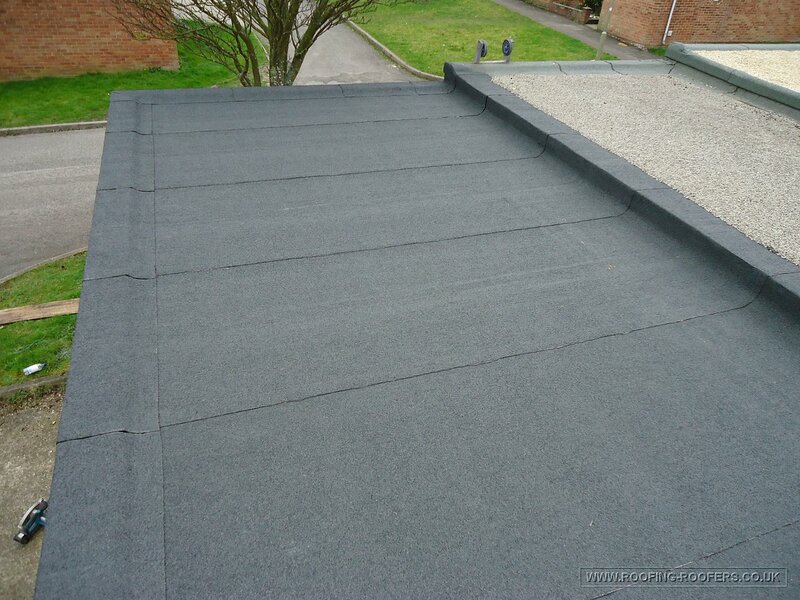 This system has an effective working life but like many roof coverings they are exposed to all the elements through out the seasons. 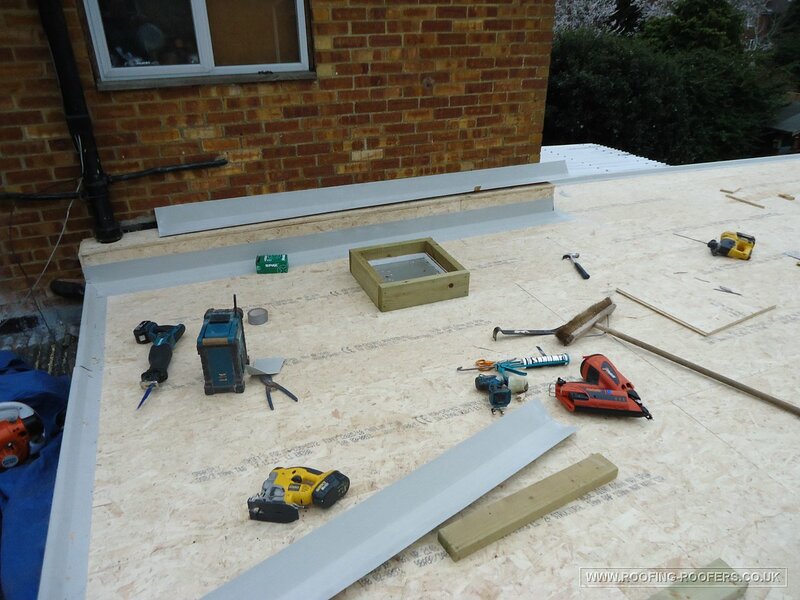 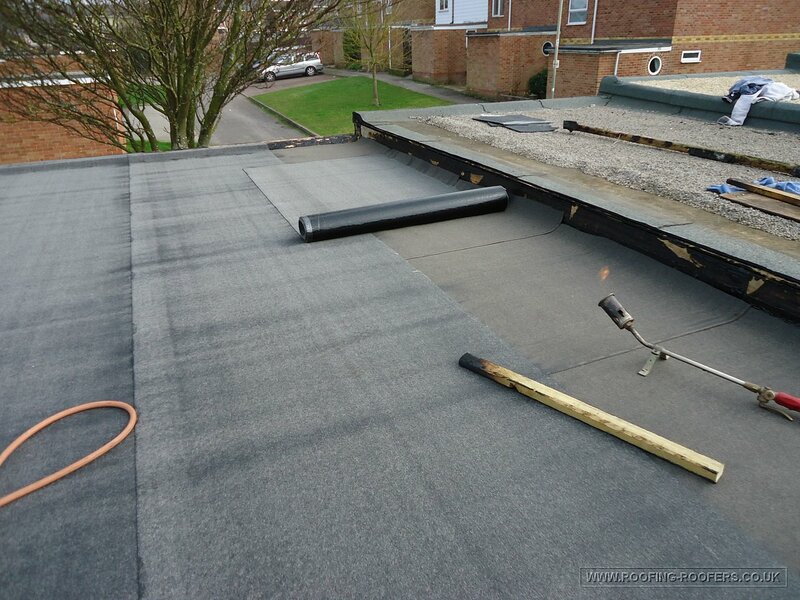 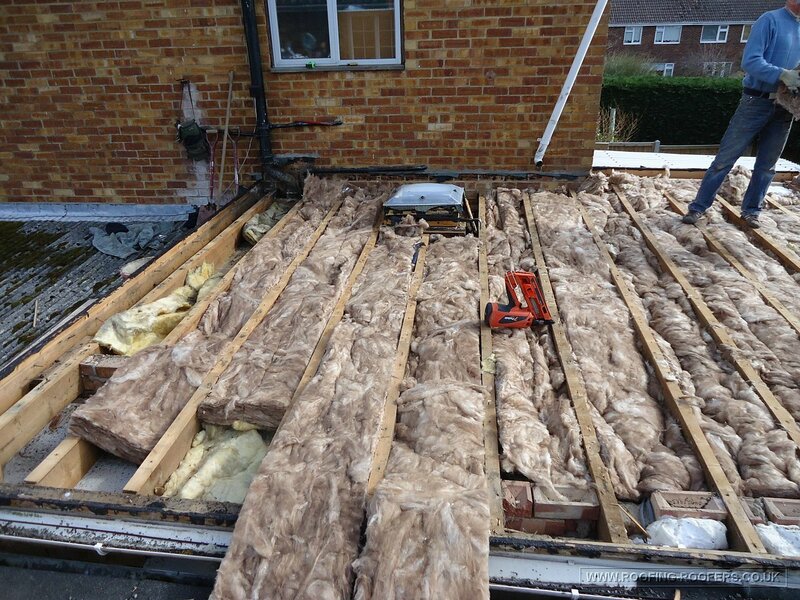 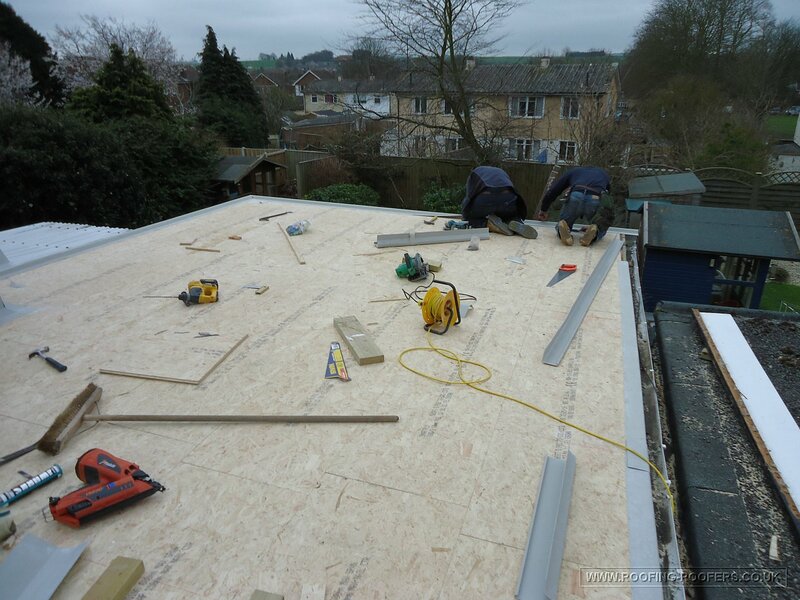 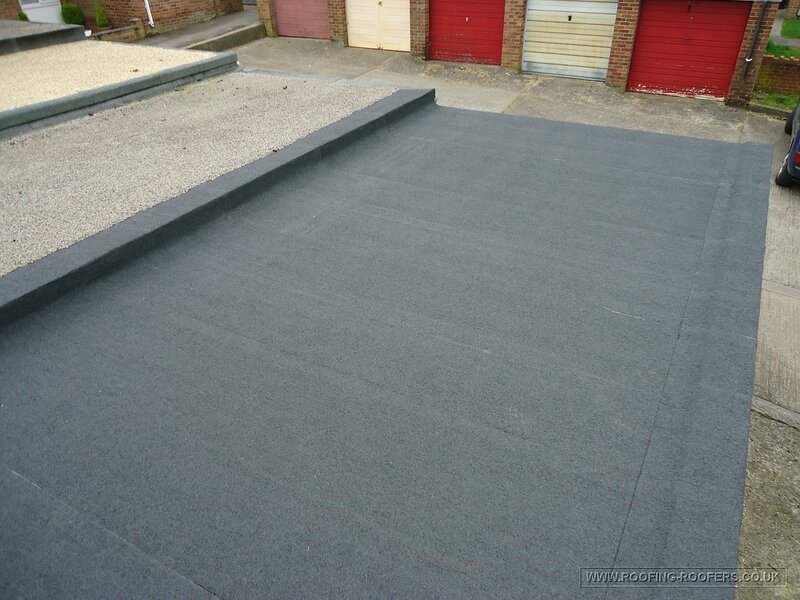 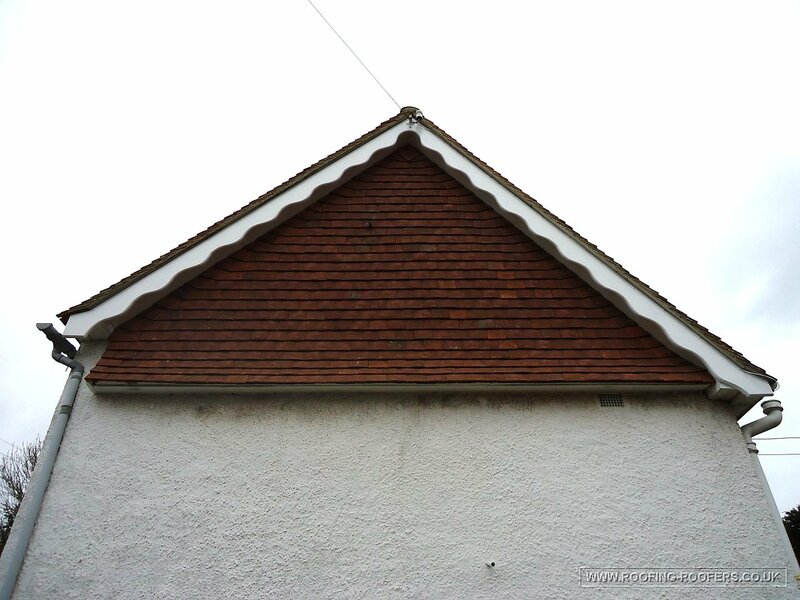 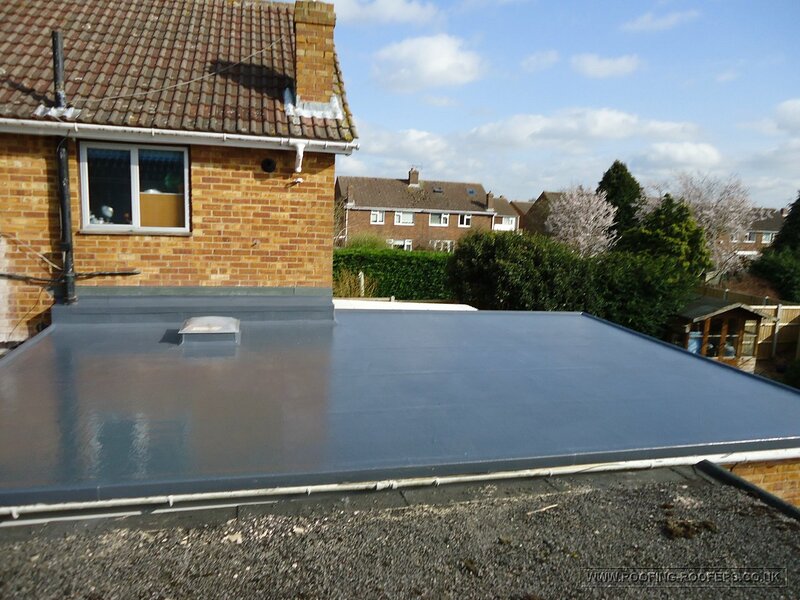 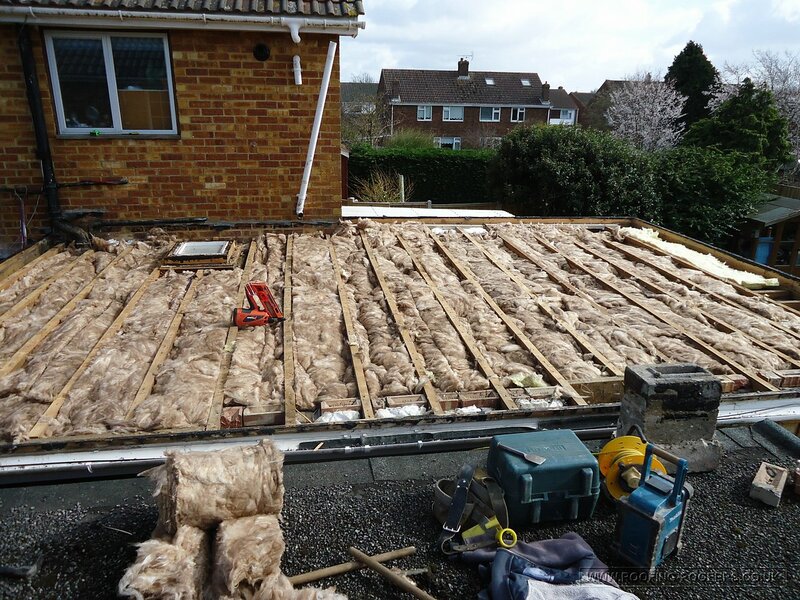 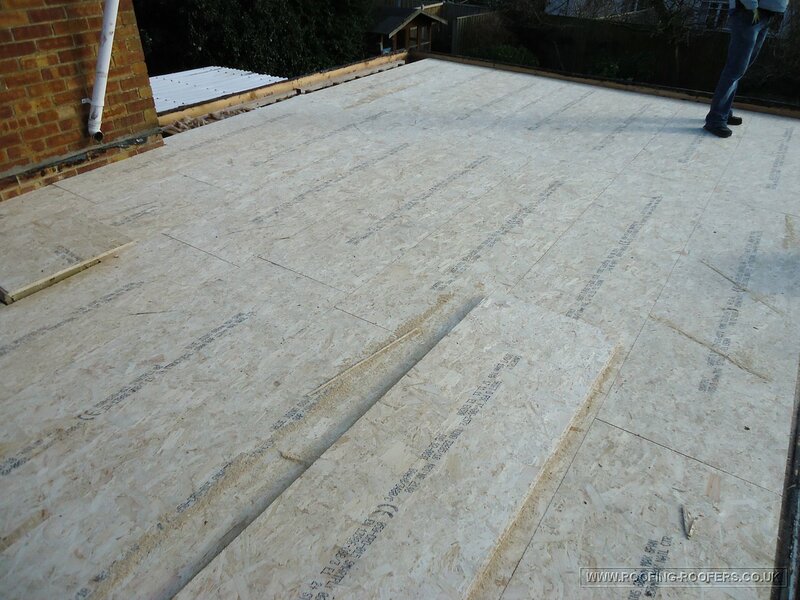 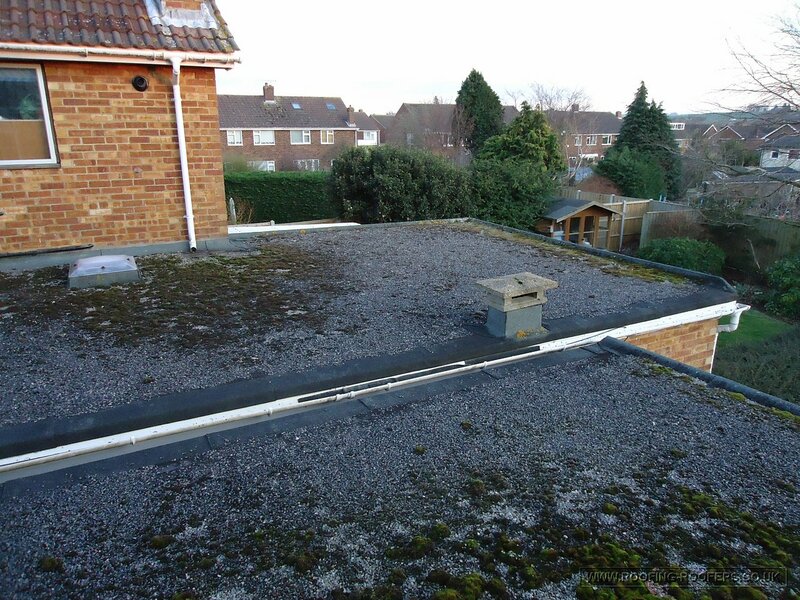 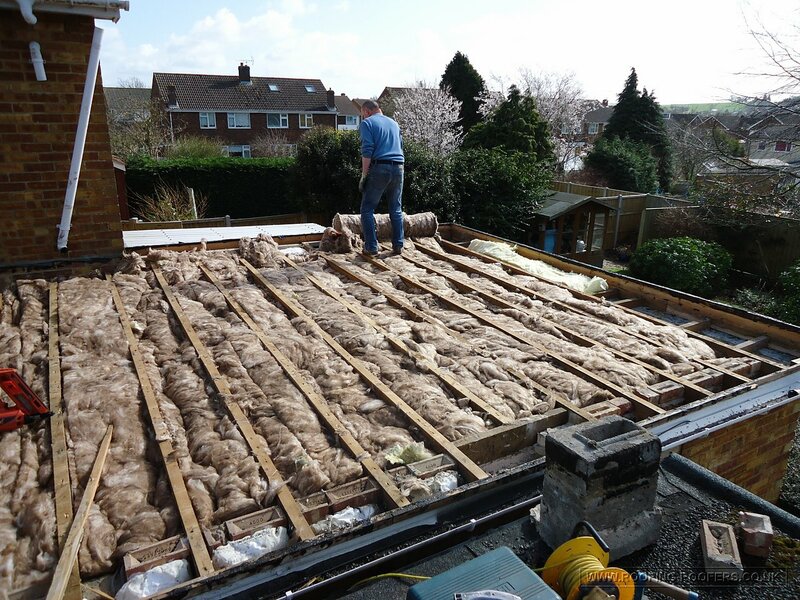 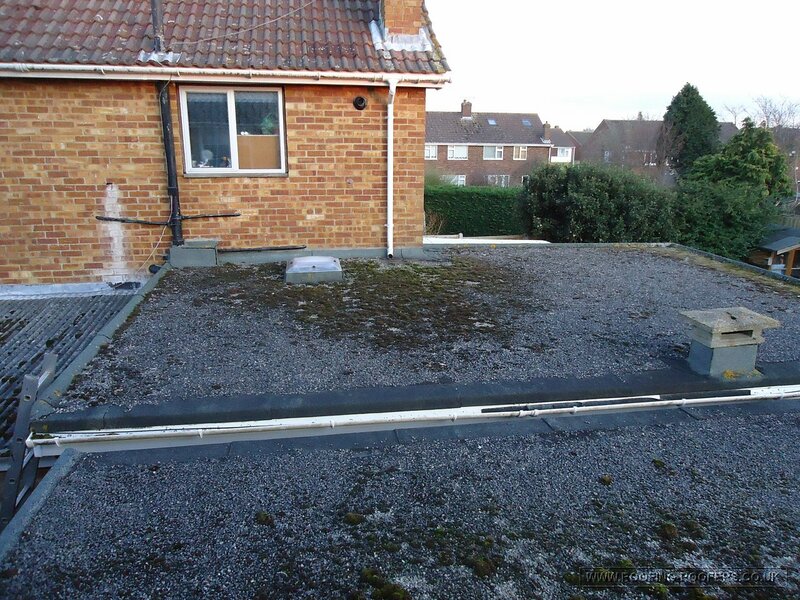 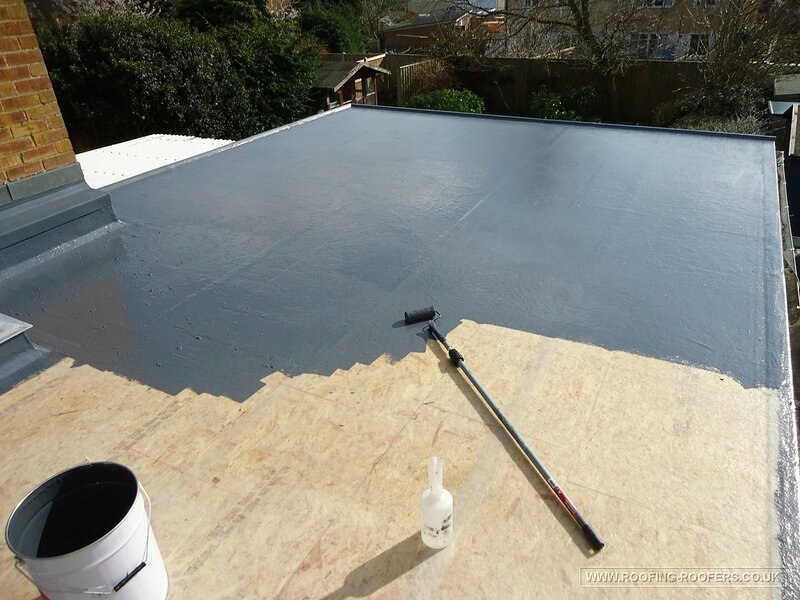 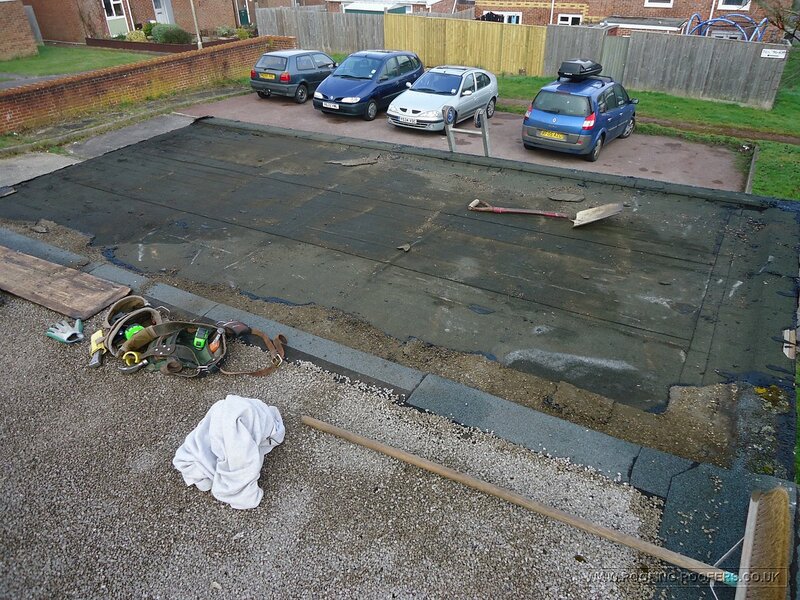 On this garage roof in the Wantage area we stripped it back to the original close boarding and re-layed new using the three layer system which is heated to bond the layers and provide a watertight effective covering. 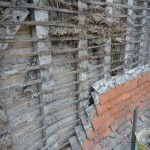 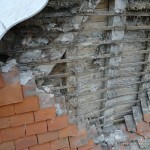 Vertical tiling Job Description: Removing existing vertical tiles from North & South end elevations. 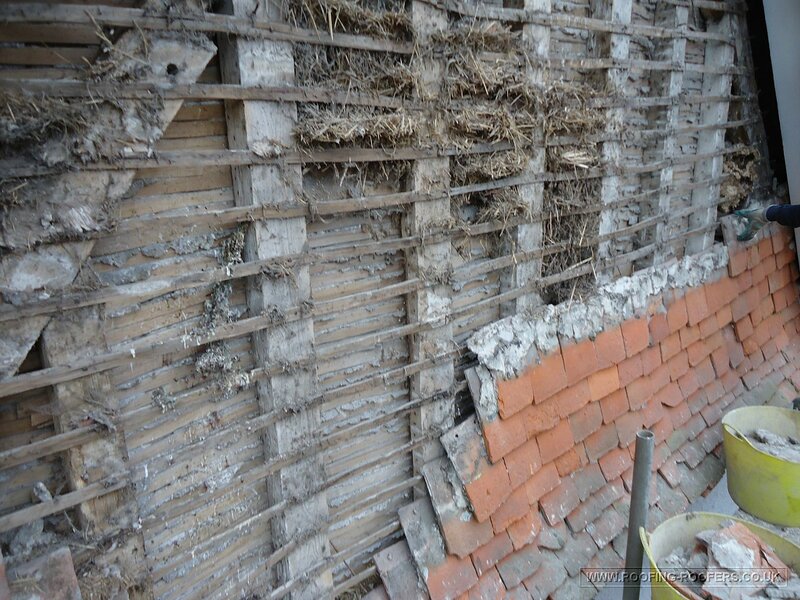 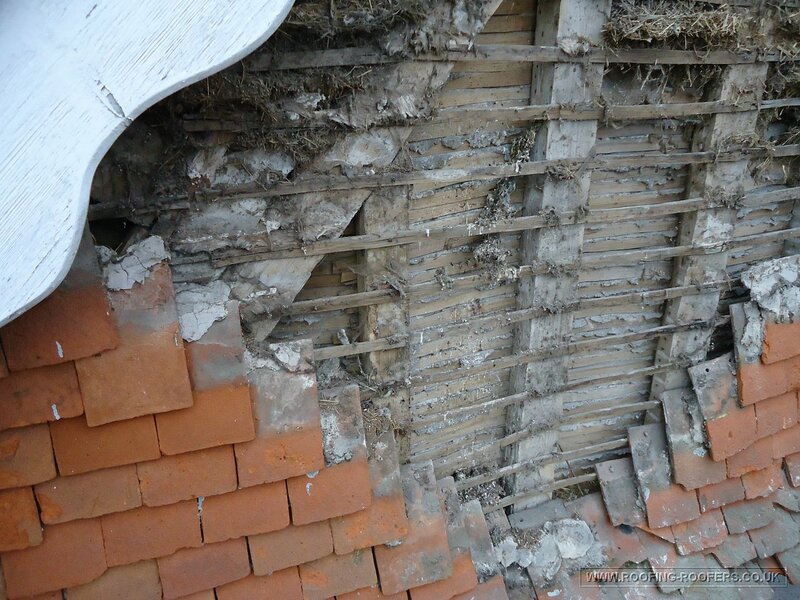 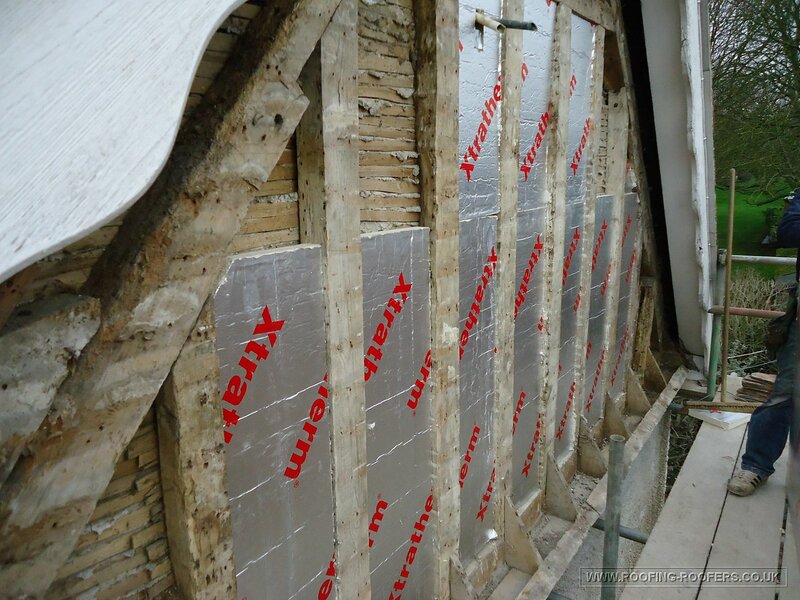 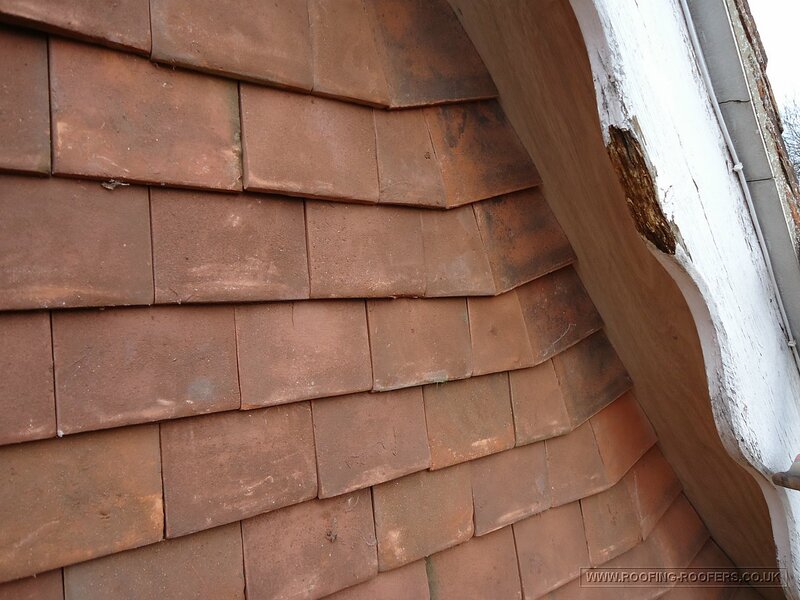 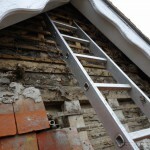 Repair and treat perished timbers, insulate between timbers, felt and batten and put new clay tiles back. 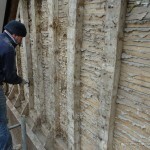 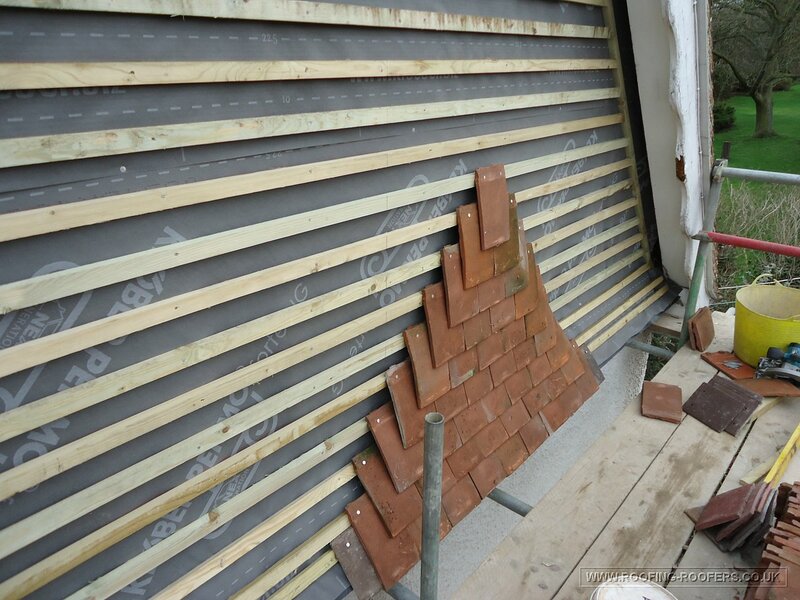 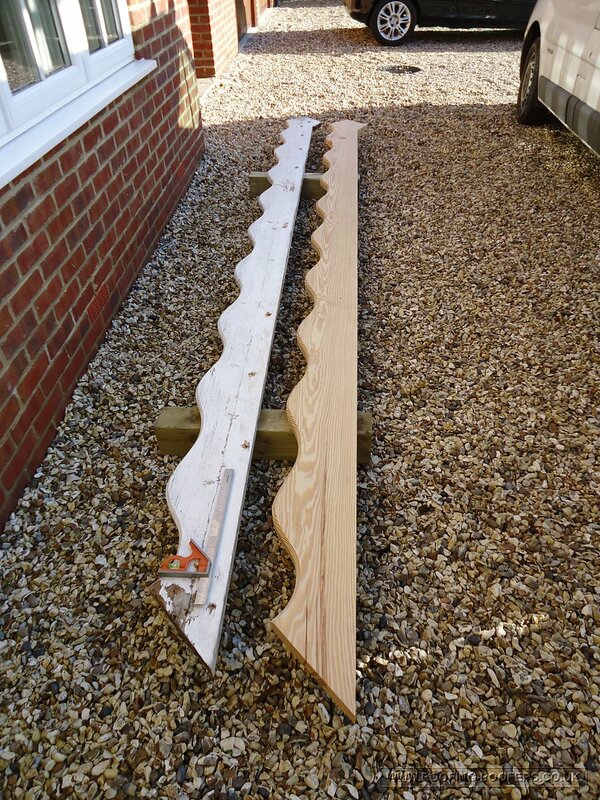 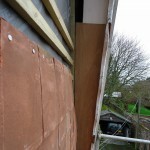 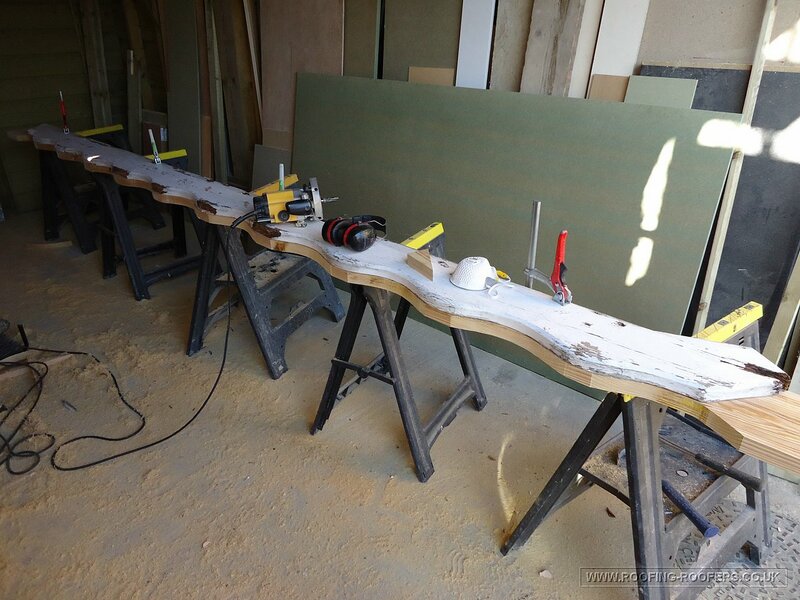 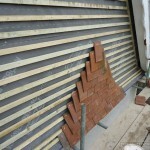 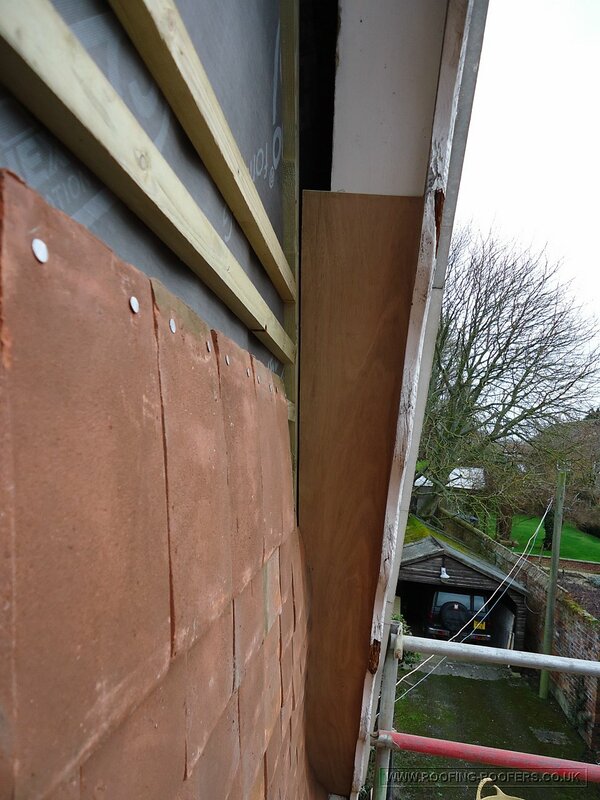 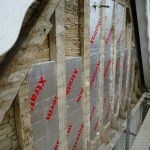 The timber barge boards also needed replacing as you can see from images. 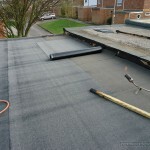 When i first left school this was first ever roofing job i did with a local roofing company to the roof on which I have replaced the vertical tiling (they never had the vertical tiling done). 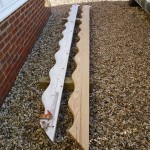 I remember helping the carpenter way back then in 1990 to put up these barge boards. 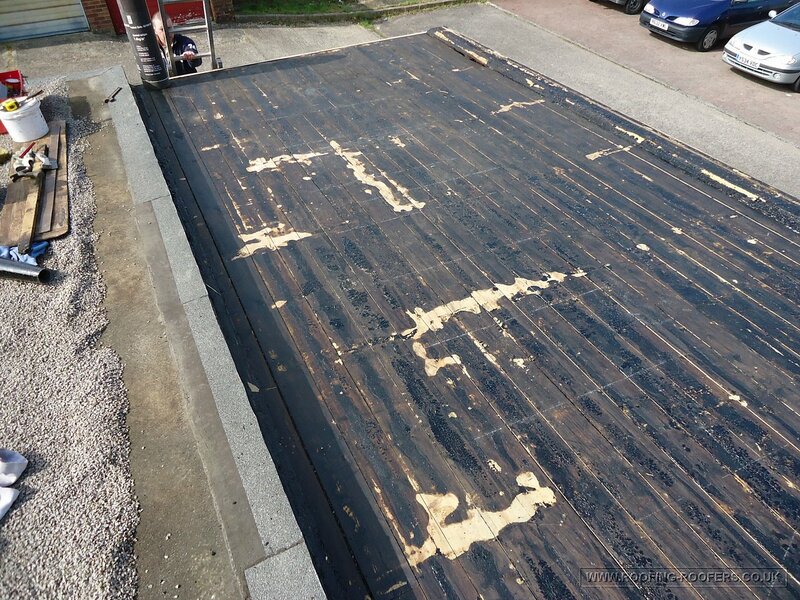 We have replaced these with a high grade heavy pine timber, which is a better quality timber giving it more longevity needed especially on the south end roof. 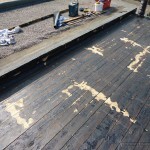 The barge boards would have lasted if the owners had them decorated a little more often. 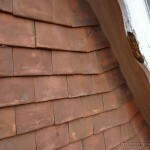 Matching the existing in every detail and seeing it back in place is a very satisfying part of my work. 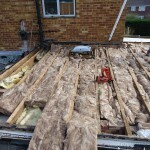 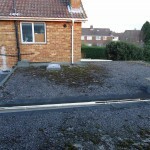 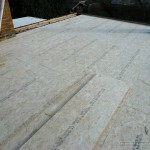 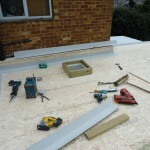 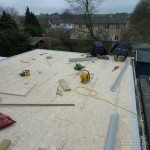 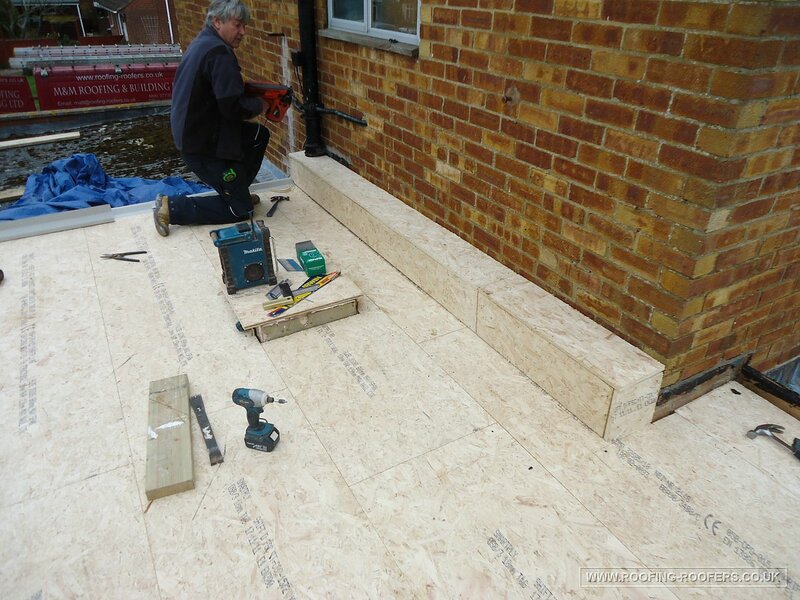 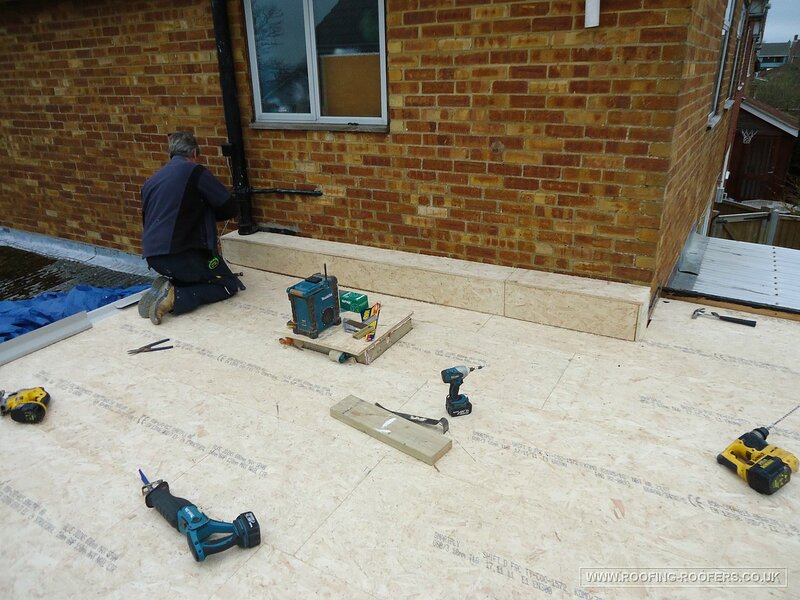 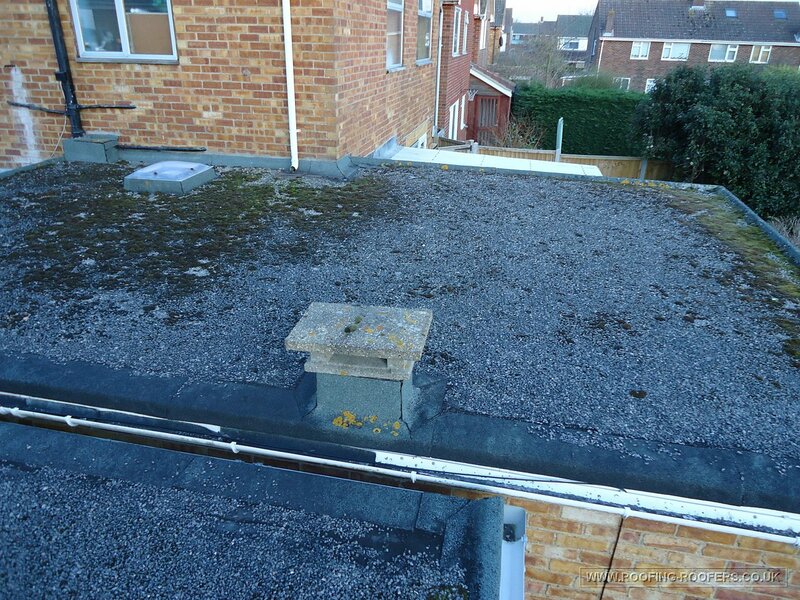 This flat roof extension had been on for about 25 years so the built up felt system had lasted well. 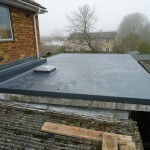 Since undertaking full training in the GRP glass re-inforced plastic roofing materials I suggested the 20 year GRP Scott Bader system for this roof. 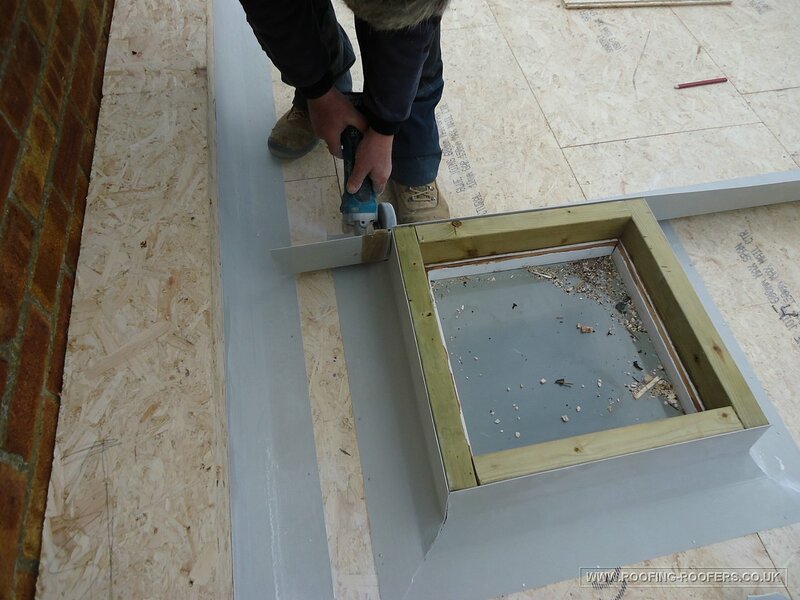 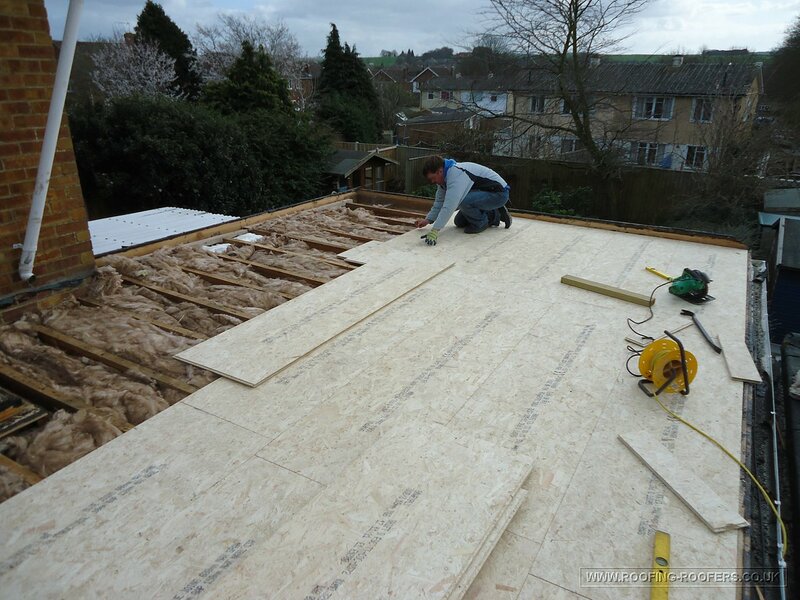 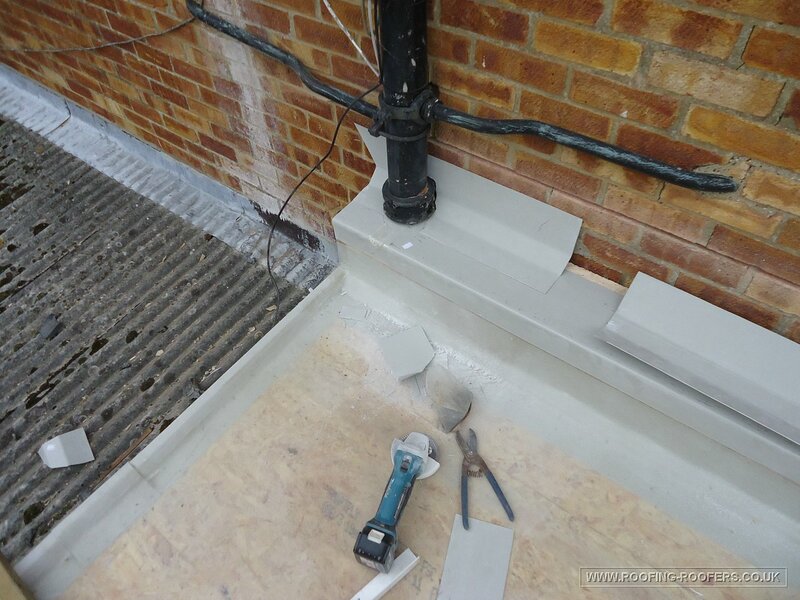 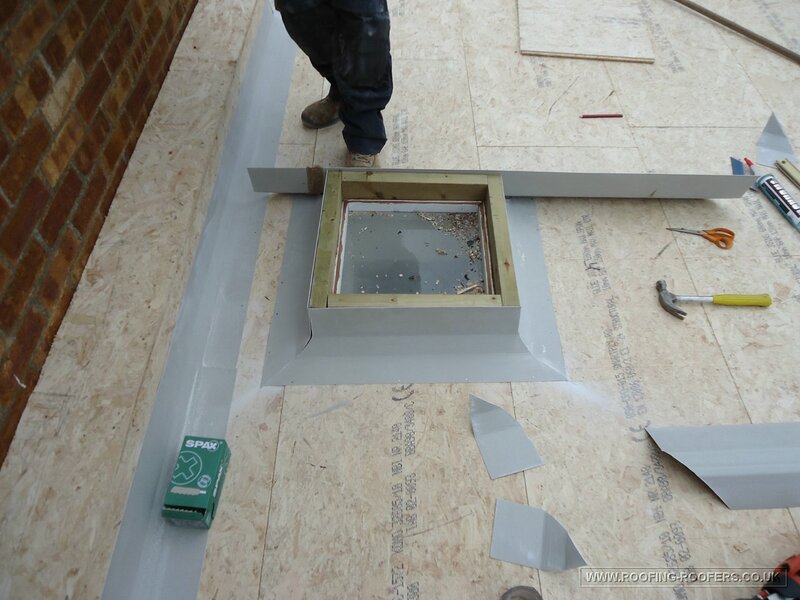 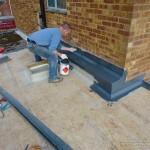 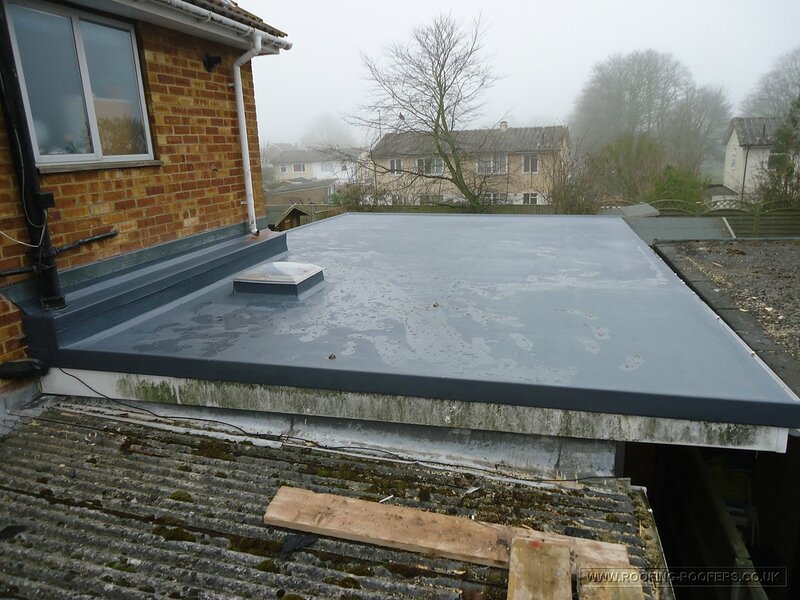 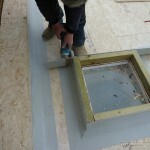 The felt and boards were completely removed, an upgrade in insulation to the latest standards and then a new timber substrate and the grp system applied on top. 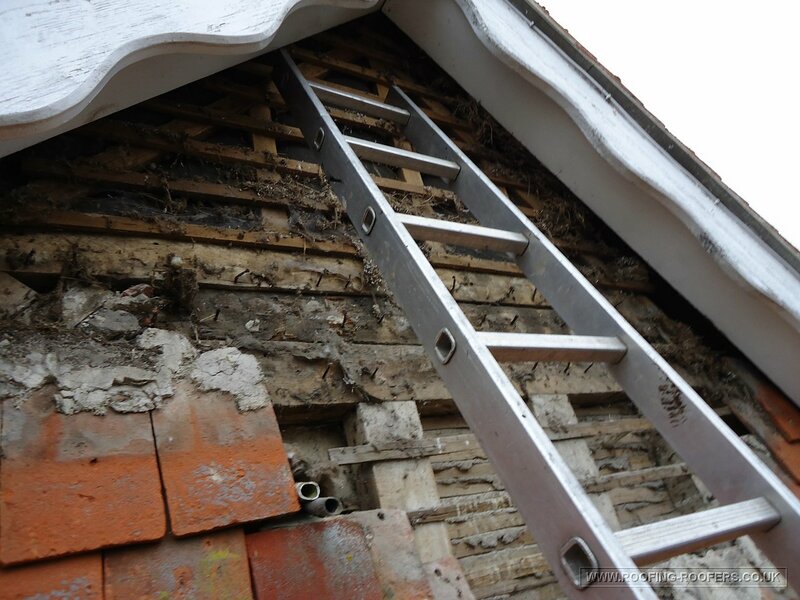 There were some timber repairs and remedial work to be done and the removal of the old gas vent which came through the roof. 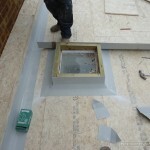 With the current spate of wet weather the newly installed roof covering has more than shown it is the material for the future and does it’s job very well indeed. 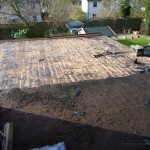 A lot of my work involves flat roof repairs and full overhauls after time and the weather has taken it’s toll. 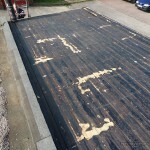 Here is another testimonial from a satisfied client and he details the service I provided for him and what all my customers receive.